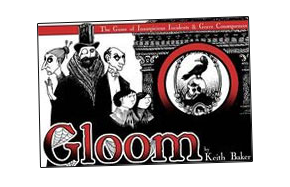 In Gloom, you assume control of the fate of an eccentric family of misfits and misanthropes. This card game immediately stands out from the pack (boom tish!) by having transparent cards; an ingenious idea that is then carried through to the game mechanics of covering up and revealing point scores on cards placed on top of one another. The Edward Gorey-esque theme is a lot of fun, though he doesn’t actually get a mention. This rules summary and card inventory covers the first edition game and the four expansions Unhappy Homes, Unwelcome Guests, Unfortunate Expeditions, and Unquiet Dead. There’s a new expansion out for quite a while (Unquiet Dead), will this be updated at any point?